Read Minor’s novel excerpt at Guernica; you won’t regret. With all the hoopla surrounding the DOGZPLOT party and the Vouched ATL launch reading/party, we’ve not gotten to do as much of what we do here best at Vouched Online, which is recommending excellent online literature. Not a week earlier, he had gone into a dark dirt-floored house where the rainwaters that leaked from the stone-covered rust holes in the tin roof were falling on the bodies of Leila Altidort—the wife of his best Haitian friend Kenel—and her stillborn baby. Blood everywhere. Stained the ground, her legs, Kenel’s hands and chest as he held his wife’s head to his chest. He put the dead baby in her arms, and he held up her arms with his arms, and they rocked there, the three of them, the two dead, and the one living. And when Samuel came into the house and saw them there, he joined them, put his arms around Kenel and the bodies and rocked with them. He didn’t need a doctor to be first to the diagnosis: Placenta previa, that low-ride and tear in the uterus that killed the mother, and that horrid umbilical tangle that strangled the baby with the life-giving cord. So often it was this, the too-late diagnosis for want of an ultrasound machine, a sonogrammer, to catch it early, and mother and half-term baby bled to death within spitting distance of the mission hospital. He wanted to grab old humorless Phelps by the lapels and shake him and say: This is what is sacred. This is what you want me to say, and I will not say it. But time would play the changes. He knew it. The time would come, and he would say the words, use the gruesome story of the untimely and purposeless death of Kenel’s wife and baby to get the money, then use the story again on the disbursers of the money he raised, to try to convince them to use the money to buy, really buy, an ultrasound machine, instead of another batch of battery-powered radios that would only tune to the one radio station, the one with the preaching and singing the mission approved. To try and fail, because Brother Joe and his ilk—those who controlled the purse strings—would say: What power is there in the ultrasound machine? The ultrasound machine proclaims on one life, but the radio station proclaims to tens of thousands the greater message, for the greater life giving, and: Don’t do that, they’d say. Don’t do that to me. Read the full excerpt at Guernica. It was hard to decide what I would excerpt, there are so many incredible passages. You must read this. You must be patient after reading this, for the novel is not slated for release yet, and so you must wait, we must all wait for this. 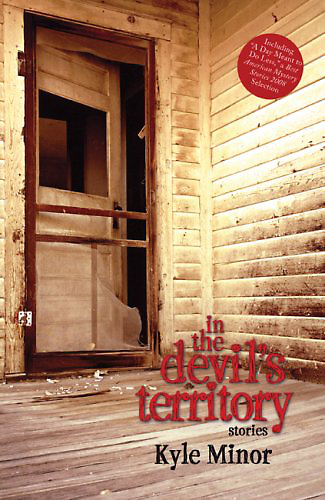 Kyle Minor‘s In The Devil’s Territory is a release from the good people over at Dzanc Books! This is what it feels like to take a man’s confession: a rotted specimen is passed to your hand- peel its outsides back like wrapping paper, or crack it like a shell- hand it back to them to hold.